Stir saffron into white wine; let stand for 15 minutes. Season chicken all over with salt and pepper. Heat oil in large deep high sided skillet or Dutch oven set over medium-high heat. Cook chicken for 8 to 10 minutes or until browned all over. Transfer chicken to a plate. Drain any fat from the pan. Reduce heat to medium, add onions and garlic; cook for 3 to 5 minutes or until golden and softened. Stir in rice, thyme and paprika. Cook for 2 to 3 minutes or until rice is well coated. Stir in wine and saffron mixture. Bring to a boil. Cook for 3 to 5 minutes or until most of the wine has evaporated. Add 2 1/2 cups broth and tomatoes. Bring to a boil then reduce to a simmer. Add chicken. Cook for 15 minutes. Stir in green beans, roasted red peppers, olives and remaining broth if rice looks dry. Cook for 10 minutes or until rice and green beans are tender. Remove from heat. Cover and let stand for 5 minutes. Garnish paella with chopped parsley and serve with lemon wedges. 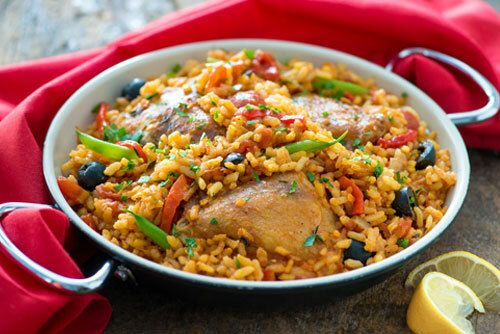 If you can’t find paella rice substitute Arborio rice.